Disney's Oscar-nominated family adventure Wreck-It Ralph arrived on Blu-ray earlier this week. This fun ode to video game nostalgia features John C. Reilly as the voice of Ralph, a pixilated villain who, after some thirty years on the arcade floor, grows tired of his place as the bad guy and decided to go game hoping in hopes of becoming a hero. Naturally, disaster ensues. We recently caught up with director Rich Moore to talk about the film's many classic cameos, and the one's that didn't make the cut. Here is our conversation, where Rich Moore reveals his love of Tapper, Dirk from Dragon's Layer, and the fact that we may just see Mario in the sequel. Were you surprised to see a resurgence in the popularity of Tapper after the film came out in theaters last year? The old guy's started to pop up in bars across America yet again. Rich Moore: Oh, my goodness! To me, he was always popular. It's good in this case. I fell good that people are finally realizing what Tapper can be, and how big he is. It is a real personal victory for me. Do you have a Tapper game in your personal bar or rec room? Rich Moore: We have one. There is a guy here, that works in the studio, that has a lot of video games in his home. He had the cabinets. He was kind enough to bring a bunch of them in during the production of the film. That was definitely one where I said, "Ooh, do you have Tapper?" And he said, "I sure do!" I asked him to bring that it. We even built an area near our workspace, next to my office and my producer's office, and we made it out to look like an arcade. Like the one from the film. It's adorned with some of the great games, and Tapper is definitely one of them. Tapper is right across from Q-Bert, so...It feels like all is right with the world. Q-bert...He's another one that has a cameo in this movie that everyone loves. It's amazing that you got all of these great characters into the movie. Who got left out that you wanted to see return, maybe in a sequel? Rich Moore: Hmm? One obscure one, which turned out to be a lot of trouble...To procure...Dirk the Daring from Dragon's Layer, from the Capcom game that had 2D animation in it. I loved that game as a teenager. It seems like it came out right at the moment where I was deciding where I wanted to go to school, and what I wanted to do, and which type of animation I wanted to go into. Seeing that game in the arcade, I was like, "Oh, my god! This is the marriage of the two things I love most in the world! Video game and animation!" That game, and that character, were really special to me. I wanted to have Dirk in the film. But it turns out, there was a lot of red tape. So many different people own so many different parts of that game. Like, someone owns the rights to the name, someone else owns the artwork on the cabinet, one person owns the rights to the image of Dirk, and someone else owns the rights to the image of his horse. It was a piecemeal, so much, it made it difficult to get the rights to use him. And then the big one! We just couldn't find the right spot for him in the film. He is, of course, the great Mario. Which I am sure you've heard of (laughs). We have a great relationship with Nintendo. We were able to find the perfect place for Bowser, in the Bad-Anon scene, which was totally appropriate for Bowser to be in that scene. We were so happy to include him. The feeling was, if we can find something that is appropriate for Mario, odds are good that they will let us use him, too. Unfortunatly, over the course of developing the movie, that scene never bubbled to the surface. The ways that we were trying to include Mario in the film felt forced and not very organic. To the point where I had to make a final decision. I had to say, "You know what? Let's not force the character in the movie. Lets hope that we are lucky enough to do a sequel, and we can find that scene in the sequel." So, I have my fingers crossed that we will be doing a sequel, and we can go to Nintendo and say, "We have the perfect scene for Mario." Who do you get to voice Mario? Captain Lou Albano or Bob Hoskins? Rich Moore: Oh, boy! I am a Bob Hoskins fan myself. And I don't even know if Captain Lou Albano is with us. I think he may have of passed. I might have my easy answer. Or you could just scrape through those shows and cull his dialogue from there. Rich Moore: We could do it. These days, we could take all of his dialogue, break it down into syllables, and perform it with a Speak-N-Spell. Thinking back...I haven't played any of the more recent games with Mario, but does he ever say much in the games, does he? Rich Moore: He didn't. And he doesn't really say too much in the new ones. It's a lot of laughing, and "Woo-hoos!" I don't know. I'm sure Nintendo has their ideas about who would be the perfect Mario. But that would be a great challenge to be facing. Going back to Dirk and Dragon's Layer, did Don Bluth serve as a point of inspiration for you? Rich Moore: I loved The Secret of NIMH. When that came out, it felt like, "Wow, this is something really, really new." It looked like a Disney film, but it felt very cutting edge to me. To a twelve-year-old kid, it seemed very inspiring. If nothing else, to see that someone was making an animated film when there just weren't that many. You know? He was something of an inspiration. And those two video games, Dragon Slayer and Space Ace...They hit right in my sweet spot. The fact that there was someone making video games using 2D animation, the type that I loved...That was irresistible to me. I thought, "If I can make a career out of doing these kinds of games, I could die tomorrow..." That doesn't make any sense. If I could make a career out of it, I could die tomorrow. Then I wouldn't have a career. You would leave a very short, but nearly flawless legacy...Now, the game, Dragon's Layer...When I played that as a kid, I found it incredibly frustrating. It cost double what any of the other games cost. And the game was over three times as fast as any other game. It was coins in, done. And the line to play it was crazy long, so you only got that one shot. Rich Moore: That was one of those games, when I first saw it, where I said, "I am going to get to the end!" You know? Prior to that, I don't think there were too many games that you could take to the end and finish. Everything was, you play until you die. To me, there was something that was a challenge. This was something I could not resist. I could play this, and see the whole movie. There is an end to it, and you can beat it. I spent a lot of time and money to get to the end of the game. I swear, I watched...Someone had a DVD with all the footage. It used to be on a laser disc at one point. Its on YouTube, also, but its weird...I haven't played this game since it came out, but watching it, the motor-mental muscle memory....The right, right, left...It came back. I couldn't remember the whole thing, but sections of it...It is etched into my brain. You know how they say that old people with Alzheimer's, they kind of go back, and they revert to the most emotional part of their life, what they did when they were younger...I think I am going to be cursed with reliving Star Wars: Episode IV - A New Hope in my mind. And playing Dragon's Layer, when I enter Alzheimer's. It's sad to say. Rich Moore: "What's wrong witcha?" "Oh, he's fine. He just thinks he's being burned to death in Dragon's Layer." I don't have an opinion about this, but maybe you do. Back in the day, Disney didn't stunt cast their films, and while they used certain models for characters, they weren't modeled after the celebrity voicing them. Why do you think its important to have the characters in Ralph resemble the actors playing them? Rich Moore: I think its something that is cool. There are different camps that will say different things. "That's fine! But if you want to create a brand new character, you are using that as a crutch." To me, I love being able to see some of John C. Reilly's face in Ralph, and some of Sarah Silverman in Vanellope. That there are hints of them there. In the broad strokes, they are there. 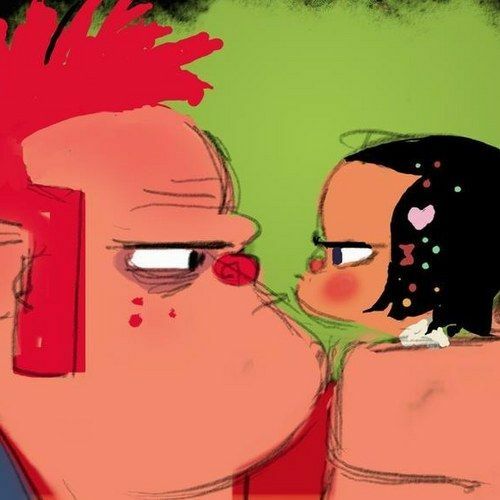 They are never total caricatures of the whole actor, but I love being able to look at Ralph and Vanellope, and Felix, and Calhoun, and being able to see the actors there in some way shape or form. I think its because, as a kid, I loved The Wizard of Oz. I loved the Scarecrow, and the Tin Man and the Lion, and you could kind of see the actors' faces in them. It wasn't an entirely new face sculpted around them. What made those characters so human and appealing to me was seeing those great actors underneath there. They weren't lost behind a bunch of appliances. I think that movie benefited from it so much. I think, subconsciously, that was the angle I was coming from with this. I think there is so much humanity in each of their faces, that it would have been a waist not to have that represented in these animated characters. I look at them, and I love how they look. And the way they make people feel, and the way they make people laugh. I am really proud of what our designers and animators did with these characters. Well, I love the movie. I don't mind telling you that, and I hope there is a sequel. Rich Moore: Me too, I would love to go back to this world.